Cell Navigation: Do Cells Refer to Some Kind of Ethereal Body Map? Nature does not construct things the way humans do. Nature does not build mono­liths. It assembles what it is building by gradually adding millions of tiny building bricks. Each type of building brick and its associated adding-rule determine what kind of object will be built. Nature builds things according to what is termed fractal geometry. A cloud is a good example of a natural object con­structed according to the rules of fractal geometry. 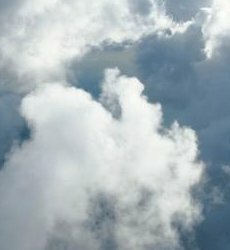 A cloud can take on and evolve into any shape depending on the initial and subsequent atmos­pheric conditions in the vicinity where it is forming. A cloud needs no structural plan or map for each additional water molecule to take its proper place. Each additional water molecule latches on and be­comes part of the cloud if it passes close enough in the right direction and at the right speed. A cloud has no pre-ordained form or shape. And it certainly has no function or purpose beyond its being a part of the weather systems in the Earth's atmosphere. A snowflake is also the product of a fractal construction process. It too grows by the arbitrary capturing of water molecules from its surroundings. 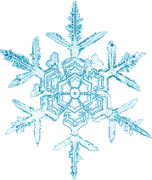 Yet a snowflake has an additional property: it has a solid geometric form. This is determined by the way in which the water molecules connect when they are captured. Snowflakes take a variety of forms. These nevertheless follow a fixed underlying theme that is essentially hexagonal. Like the cloud, though, the snowflake is merely a structure. It does not perform a function that is above and beyond that of simply being. A leaf is also fractally constructed. However, unlike a cloud or snowflake, a leaf does not grow by capturing passing molecules from its surroundings. Its building bricks are living cells. 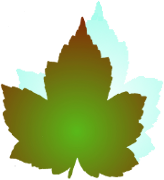 The leaf's cells take in nutrients supplied by the tree and thereby grow bigger. When a cell becomes big enough it divides into two cells. Thus the building bricks of the leaf increase in number until the leaf reaches its full size. The form of the leaf is predetermined for each specie of tree by the particular rule by which adjacent cells in the leaf connect with each other. It is interesting to note the similarities between the geometry of the leaf and that of the snowflake. The leaf, if you include the stalk, also has the form of a hexagon, albeit a rather distorted one. The leaf, however, is something much more in principle than a cloud or a snowflake. A cloud and a snowflake are merely structures. A leaf is a functional device. It performs a function that is above and beyond its mere being. It performs photosynthesis, which is key to the process that converts carbon dioxide and water vapour into wood. Notwithstanding, the leaf presents a problem. Clouds freely grow as big as they can. That is, they grow until there are no more water molecules left in the vicinity that it can capture. The snowflake freely grows as big as its structure can sustain without breaking under its own weight and internal stresses. But what determines how big the leaf grows? What tells the cells of the leaf when to stop dividing? Perhaps trees bud when the temperature reaches a certain threshold level in the spring. The buds grow into leaves that reach a certain size after a certain time. The leaves stop growing when the rate of change between day and night slows down over the summer. In the autumn their functionality diminishes until they shut down and fall off at the beginning of winter. The leaves therefore grow to the size they can in the time available. That is what determines their maximum size and tells the cells when to stop dividing. But what about pine trees and other evergreens whose leaves do not go through a seasonal cycle? Assuming leaves generally all work the same way, this explanation would not seem to be the correct one. 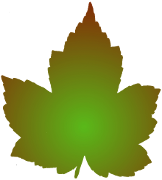 The leaf is constructed by a fractal process. It is built up cell-by-cell. So perhaps its growth control system is also fractal. That is, each cell somehow decides when to stop growing and consequently, stop dividing. This way the cells themselves decide when the leaf has reached its full size. But by what means can a cell know when the leaf, of which it is a part, has reached its full size? The cell cannot see. It has no global view of the leaf. Its only way of receiving any information is via chemical messenger molecules it encounters within its immediate environment. The next question is, what sends or originates these "full size reached" message molecules? The originator would have to be another cell somewhere in the leaf. Once the first message molecule were sent, each cell that received it could emit another one to pass the message on so that the message spread rapidly throughout the leaf. But how (by what criteria) does the first cell decide to emit the first "OK chaps! All stop dividing!" message? This is rather paradoxical. It is therefore not likely to be the correct explanation either. Another option for a cell to know when to stop dividing is what I term generation counting. When a cell enters its division phase, it increments a generation counter. If it were a first-generation cell (generation count=1), the two cells it becomes will have generation count=2. And so on. The cells are pre-programmed to divide unto the nth generation and then stop. This option would require the cell to contain an equivalent of flash memory for its generation counter. The cell would have to update symbolic or representative data within it. I don't think such data processing functionality exists within a biological cell. A cell contains a lot of symbolic data but I don't think it has the facility to update it or change it, only to read it and switch parts of it in or out. Besides, it would require "somebody" with a global view of the leaf to tell each cell-type how many times to divide and the kind of fractal valency geometry to follow in order to construct a leaf of the right shape and internal functionality. There is an aspect of fractal construction in the human body. Apart from its having lost its tail, the form of the human body is hexagonal like a snowflake. The six protrusions from the central mass are the head, two arms, two legs and the absent tail. The hands and feet are fractal extensions with 5 digits plus the connecting arm. Aspects of fractal structure undoubtedly continue down into the detail. Consequently, in theory, the human form could be generated by a fractal geometry program running inside a computer. It would be a fractally-generated sculpture of the human form. The program could probably be tweaked to create a human form in any desired pose or position. Such a sculpture, however, would simply be a structure. It would lack human functionality. It would not be a living operating human being. The human being is a functioning system of biological devices that are merely accommodated within a structure that has the same form as the sculpture. A system made up of interconnected functional devices is not fractal. It cannot be constructed solely by iterative growth and division at the microscopic level. It needs to be assembled according to a global plan. This plan must be concerned primarily not with the body's structure but rather with its function, which is above and beyond its mere material form. From a functional point of view, the human body is made up of subsystems (organs, muscles etc. ), each type of which performs one (or perhaps more) of the functions necessary to make the whole body work as an integrated system. A generic body cell (called a stem cell) is able to switch its internal program to turn itself into any one of the 216 or so different functional types of cell that make up the human body. A cell's only known means of communication with the outside world is by absorbing and emitting chemical signals from and to its immediate environment within the body. To the best of my limited knowledge, these chemical signals are carried by some kind of messenger molecules. Perhaps the cell switches from being a generic type to a specific function in response to such a signal. A stem cell could thus decide to switch into a particular functional type according to what type its neighbouring cells are. But how does it know where the boundary of a particular cell type should be? If it is at the current boundary of where cells have all switched to become brain cells, how does it know whether it too should become a brain cell or whether it should become part of the brain's surrounding tissue? It can't really get such information from its neighbours. I cannot see how it could possibly get this kind of information from anywhere other than by reference to some kind of overall 3-dimensional map of the human body. The only option for avoiding the need for a pre-existing overall map or template is the ultimate one I outlined above for the leaf. A human embryo would have to start by forming one each of the 216 or so different cell types that occur in the human body. Each of these would have to contain, within its internal control programming, an imperative to divide n times until the necessary 50 to 100 trillion cells had been created, comprising the appropriate proportions of each kind. The problem here is that the human body does not simply comprise 216 segregated masses of cells. For example, muscle cells have to be located in 639 mutually isolated places upon the human skeletal structure. How can the generic cells in each of these 639 locations know that they are supposed to switch to become muscle cells without referring to some kind of navigational map of the body? Perhaps the symbolic data stored within each cell contains a global map of the body that details the cell-type for each sub-volume that corresponds to each muscle, vital organ or tissue. Notwithstanding, an internal map is not sufficient. A map is no use to anybody who has no way of seeing where the real features are, relative to him, within the real landscape. For example, suppose I am travelling through a strange land and I want to know where I am. I look around in the real world and see a mountain ridge towards the south-east. I then try to identify it as a feature shown on my map. I see it where I have circled in red and deduce that I must be looking at it from the direction shown by the red arrow. Presumably, on my map, the mountain ridge will have its name printed next to it. Now I know where I am. However, if, like a cell, I have no way of sensing the relevant features on a real-world framework or template, my internal map cannot tell me where I am. So, as an embryonic stem cell, I cannot know what type of organ or tissue cell I am supposed to switch myself to become. Even a single organ is not simply a mass of similar cells. The brain contains (as is currently thought) about 200 billion neurones. Nevertheless, from its very beginning, it contains function. This requires that at least some aspects of its structure be non-fractal. Consider an old-fashioned electronic device such as a radio or amplifier. Suppose it grows by means of resistors, transistors, inductors and capacitors growing and dividing like cells according to a fractal geometry procedure. Their arrangement will be purely structural. Unless the growth is orchestrated according to a global plan, that conglomeration of resistors, transistors, inductors and capacitors will not form a functioning radio or amplifier. Likewise, for the brain to begin performing its required task within the body, its neurones must be connected according to a global functional plan. This function is no more derived from its fractal structure than is the sentiment of a poem derived from the paper and the ink by which it is recorded. So how do the neurones of the brain know which initial connections they must make? I liken it to starting a computer. Before the operating system can load and take control, the BIOS must already be there to coordinate the hardware functions and initiate the loading process. The brain's "BIOS" cannot be part of its fractal structure. It must be formed by connecting at least some neurones according to an overall functional map or plan that equips the brain to be able to learn. Perhaps the brain's "BIOS" is stored somewhere in each cell as an encoded connections map. Notwithstanding, for a neurone cell to be able to follow this map, and know with which other neurones to connect, it needs be able to sense and refer to its overall external landscape. I think a global connections map of the brain's "BIOS" must be far too large and complex to be stored in a cell's DNA or any other symbolic information storage facilities within the cell. However, given an external template of the brain, I think a cell could well contain a procedure on how to find its appropriate connections within such a template. My immediate intuition, therefore, is that to construct a brain, the brain cells must align themselves to some kind of overall external template or map of the brain. Indeed, every organ and tissue of the body must do this because the body as a whole is a structured machine. During the fractal building process that results in a human being, each cell must do two things. It must convert from being a stem cell to one of the 216 functional types. It must also know when to start and when to stop growing and dividing. To me it appears that a cell can only possibly do these things by taking its cues from its "geographic" positions as sensed from an overall external functional map or template of the human body. The problem is that there does not appear to be any material superstructure at the macroscopic scale (the scale of the body as a whole) against which cells could navigate (or align themselves) to form a working human system. The cells would at least need some kind of navigational field, which each can directly sense, in order to know where it is so that it can say for example, "I am located at x,y,z on the global body map, therefore I must switch myself from being a stem cell to become a kidney cell". I imagine that cells could only get such x,y,z co-ordinates from something akin to a phase pattern of force-field waves. For example, it is thought that bees, with their ultra violet vision, are able to migrate long distances by following ultra-violet interfer­ence fringes in the sky. A man-made exam­ple is hyperbolic radio-navigation as used in systems such as the old Decca Hi-Fix. But what kind of system of navigational fixing within the body could a cell possibly use in order to know what functional type it should become? Do some key cells have the specific task of providing such a navigational field? No such cell function has ever been detected to my knowledge. There is another way of navigating from a known base location to a place you have never been. It is called dead reckoning. You travel a pre-specified distance and then turn through a pre-specified angle and travel another pre-specified distance and so on until you reach your destination. Could a cell navigate by this method to know where it is on the body map in order to determine which of the 216 functional types it should become? Unfortunately, no. This is because cells do not all travel from a single origin or point of reference. Furthermore, a cell has no means of measuring how far it has travelled and in what direction. Consequently, the dead reckoning method of navigation is no use to a cell. I remember reading that Alan Turing [famed as the inventor of the theoretical computing machine] did some mathematical work on chemical waves in worms. I do not know the details. However, if such chemical waves were to exist as a train of standing waves, they could act as separate vessels in which cells of different types could be segregated into the different functional units required to construct a working life-form. Notwithstanding, such chemical waves inherently contain no information about which functions should be placed where, and how they should be linked together to produce a working body. Consequently, chemical waves would not solve the problem of relating structure to function. Lost for any better or more tangible idea, I can only postulate that there must exist some kind of navigational template made up of interacting or interfering force-fields of a type unknown - or, at least, as yet undetected. I imagine that when an embryo is very small, its navigational field must be small, comprising only as many resolvable points as there are cells in the embryo. As the embryo grows into a full-sized body, the spatial size of the navigational field grows with it, and its number of resolvable points increases to keep pace with the total number of cells in the body. 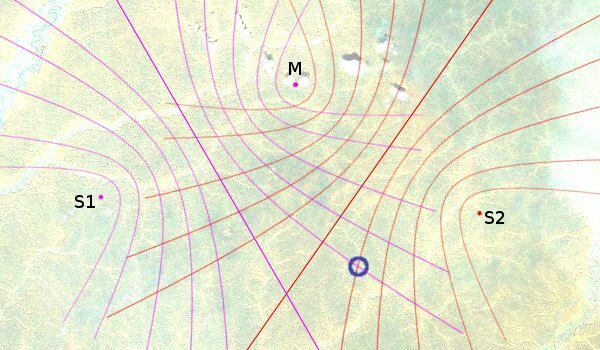 NOTE: I think that this navigational field must be somewhat analogous to an "svg" or Scalable Vector Graphics image. A conventional image file like a jpg, png or gif can display its image only up to a maximum resolution or clarity. As it is displayed ever further beyond its pre-designated full size it becomes ever more fuzzy. An svg file is different. From the data in the file, the viewing software can construct the contained image to any desired resolution. The force-field template of the human body must therefore not only be a static 3-dimensional pattern. It must be a 3-dimensional pattern that changes. In other words, it must also have a permanent pre-recorded structure within a fourth dimension or time-line. I visualise this force-field template as something akin to what I suppose esoteric people would call an astral body. I see it as some kind of hyper-physical model of the physical body that lies hidden in a higher dimension. Somehow, human body cells must be able to sense this astral body at the microscopic level and thereby map themselves onto it to form a functioning physical human being. Perhaps this astral body is where the real you resides. If so, one could speculate that one's physical body is simply to provide one's astral body with a broadband interactive communications interface with the physical world. From this, I conclude that my physical body is simply the means through which the conscious me is able to learn about the physical universe and use it to communicate with other human consciousnesses. My ever-growing knowledge of the physical world, including other human beings, thereby provides me with the context within which I am able to build intentional conscious relationships with others. Perhaps, when the physical body dies, the astral body is still there. It simply loses its coating of physical cells and hence its interface with the physical universe. Perhaps it pre-existed the physical body. However, now being equipped with a lifetime of accumulated knowledge, experience and relating with others, it has the inbuilt context to proceed onwards to its spiritual destiny, without further need for a physical body. I must admit that the whole astral body idea does not sit very comfortably within my mind. It doesn't seem very scientific. I therefore feel compelled to search for a fractal process that could achieve the same objective. I need to think of a way whereby the cells of the body could navigate their own way to their respective destinations within the body. As I left the discussion above about the leaf, the problem of how its cells manage to reach their correct respective destinations and then stop dividing remained unresolved. So, as the argument currently stands, a leaf too needs an astral body. But the leaf has only one external function, namely, photosynthesis. Consequently, a photosynthesis cell, together with whatever other ancillary cells it needs to assist it, could be distributed fractally throughout the leaf in unit functional groups. For this, a navigation map would not be necessary. It doesn't need an astral body. However, this only solves the distribution problem. Without reference to an overall view of the leaf to guide it, a proced­ure inside each cell is fundamentally unable to sense when the leaf as a whole has reached its prescribed full size. So, what tells the leaf when to stop growing? Perhaps the answer lies in the tree. Perhaps the tree issues a command to all the cells in a leaf when they must stop growing and dividing. On the other hand, perhaps a leaf grows according to a pre-programmed sigmoidal birth-growth-senility-death cycle for a prescribed length of time. This would determine its maximum size. No need for an astral body. Of course, the leaf is only one subsystem or "organ" of a tree. Nevertheless, the growth of a tree is also systemically achievable through a fractal process. Branches sprout and lengthen cell by cell, so to speak. They then, in season, sprout leaves. I think that the tree as a whole therefore operates on the same principles as those by which a leaf operates. Consequently, a tree likewise does not need an astral body as a template for its growth cycle. What about the human? The human body has a sophisticated communications infrastructure called a nervous system. It has both fast narrow-band channels and wide-band slower channels. Through this infrastructure, the brain receives and sends sense and command signals to precisely specified parts of the body. The nervous system must therefore include a very precise means of addressing posi­tions or functional locations within the body. It is evident, if not obvious, that the nervous system grows and develops along with the body right from the start. It must therefore be present in the embryonic cluster of the 216 different cell-types. This cluster must also include a cell that has a central control function for the cluster. In other words: the first brain cell. Other cells, distributed throughout the cluster, must conduct the sense and control mess­ages for the brain cell to all other cells. Whether or not this be what is really there, I don't know. Nevertheless, it is, as far as I can see, a valid functional represent­ation of what is really there. The brain is one single organ with a fractal structure. As such, it is like the leaf. It could (and doubtless does) grow according to an iterative fractal procedure that is contained within the internal programming of each cell. Unlike the leaf, the brain has pre-installed software that is not an iterative fractal procedure. It comprises programming that controls the functioning of the body as a whole and its specialised sub-systems or organs. The brain therefore grows to its full complement of cells according to a fractal procedure, which is undoubtedly contained within the programming of each cell. The neurones of the brain are therefore spatially organised according to a fractal structure. Additionally, however, they must be inter-connected in such a way as to form a holistic procedure that is able to orchestrate the functioning of the whole human body as an integrated system. Where does this programming come from and how does it get installed in the brain? a procedure to construct the body and initialise its life process. I am at a complete loss to see how all this information could possibly be stored in the mere 750 million bytes capacity of the human DNA molecule. I can imagine that fractal construction procedures could be embedded directly within other relevant sub-systems of the cell. Notwithstanding, I still don't think there could be anything remotely approaching sufficient information capacity within a living cell to store a 3-dimensional structural map of the human body or a functional specification of the body as an integrated system. For the moment, however, let us suppose that this gargantuan operating system is somehow recorded within the initial embryonic cell. The cell absorbs material from its surroundings. When it reaches a prescribed size, it divides and becomes two cells. The process repeats iteratively until there is a large cluster of embryonic cells. By consulting their internal data, they must connect to form a neural network that represents a proced­ure for constructing a microscopic communications infrastr­ucture that follows the layout of the human body. The grow­ing population of cells then consult more of their internal data to connect into a network that represents the structural map and functional specification of the human body. Following this map and procedures, the cells of the communications infrastructure (or nervous system) can be spatially addressed. As cells in each region along the nerve cables divide more, they receive commands from the neural network telling them what kind of special-function cells to become. Some thus become muscle cells, others skin cells and so on, each in their appropriate places on the 3-dimensional structural map. This way, a functioning human body can form though fractal procedures, without the need for an external template or astral body. The human body is not self-existent. It is a mere sub-system of Gaia. 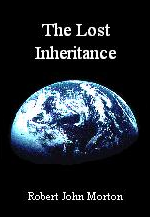 It cannot exist other than as an integrated part of the terrestrial biosphere. For this reason, the structural map and functional specification of the human body recorded in each cell must take into account the human being's interaction with and integration as part of the Earth's biosphere. Where did the cell get such vast and detailed data? As far as I am aware, the cell has no mechanism that corresponds to the function of a symbolic data recorder. It can only arbitrarily switch in or out (i.e. select or deselect) certain small parts of what is pre-recorded in its DNA. Astral body or not, it seems to me, from the current state of knowledge, that two gaping problems remain. Storage capacity: how can a symbolic representation of the struct­ure and function of the entire human body be accommodated within a 715 MiB DNA molecule? Origin: if indeed all this information is, by means of some astronom­ical compression algorithm, stored in the cell, how did it get there? Fundamentally, there is no feasible way whereby a fractal process could give rise to a mechanism that is made up of separate specialised functional components that are arranged and connected in such a way as to form an overall functional system. Consequently, on balance, at the moment, I do not see how the life-process of a human being could possibly work without some kind of external template and information storage resource. Certainly I find myself unable to formulate any purely engineering procedure through which this could be done without the guide of an external template. The weight of observation and reason seems to me, at the moment, to lean heavily towards there being a hidden template which determines the form and functional relationships of the human body. It seems, furthermore, that this template must exist within dimensions we cannot sense or detect, and consequently must be made of some hyper-physical material we do not know. The human body itself is made of physical material and its function is orchestrated by programming borne within physical media. Consequently, the body and its senses, and also the brain to which they supply information from the outside world, are entirely physical in nature. The human mind is a composite process operating within the brain and, as such, does not require any assistance from any hyper-physical realm. The conscious self, however, cannot be explained in terms of physical reality. It is something which, as if from the outside, has a window into an ever-changing part of what is going on in the mind. It thereby experiences events taking place within the physical universe. But it has more than simply a passive view. It can wilfully respond to what is happening by exerting control over the muscles of the physical body. This is so familiar to us that we lose the sense of how profound a phenomenon this is. How does a non-material conscious [self aware] entity control a physical device? So, what exactly is this interface between the conscious self and the mind process taking place within the physical brain? I would speculate that it be part of our astral body, which provides the structural and functional template for the physical body. Could not, therefore, the conscious self, by taking thought, affect the physical body in other ways? For instance, if the conscious self be depressed or in despair, perhaps the resulting psychological condition of malaise could cause the body to malfunction. In other words, invoke a psychosomatic illness. Conversely, if the body be ill or have some measure of dysfunction, perhaps by taking appropriate thought, the conscious self, via the template, could effect repairs or corrections to the physical body. In other words, effect thought-invoked or psychosomatic healing? I have seen strong evidence that these phenomena occur. An example is the healing work of people like João Teixeira de Faria [of Abadiânia-GO, Brazil] under the so-called possession of spirits of log-dead medics such as Dom Inácio de Loyola. Notwithstanding, unlike the conscious self's control of the muscles of the body, these other phenomena seem extremely inconsistent and unreliable. I am given to understand that even João Teixeira de Faria himself still relies upon, and often advises, mainstream medical treatment. But perhaps this phenomenon is like an appendage that we have neglected to use or develop.